PURCHASING A PUPPY SHOULD NOT BE AN IMPULSIVE DECISION, AND IT IS YOUR RESPONSABILITY TO UNDERSTAND YOU ARE MAKING A DECISION FOR THE LIFETIME OF THE PUPPY/DOG. View my written contract and some of my thoughts below. Puppies are up todate on vaccinations and wormings per their age. They are very well socialized. They come with a written health guarantee and a one year genetic guarantee. They also come with a LIFETIME RETURN POLICY! MY PUPPIES MUST NEVER BE PLACED IN A SHELTER, POUND OR WITH A RESCUE ORGANIZATION! It is up to the proud new owner from here on, to take responsibility for this PRECIOUS LIFE and LOVE, SOCIALIZE and TRAIN their new puppy, so he or she can grow up to be the beautiful, well mannered adult they invisioned! I highly recomend Puppy Kindergarten and Basic obedience classes to all puppy buyers, regardless of the breed. Classes are a lot of fun and teach your puppy the basics in getting along well in this big world! If you ever have any problems or questions, I am here for support for the life of your puppy/dog....feel free to contact me...no question is a dumb question! I love to Stay in touch with new owners and recieve periodical updates on the "kids", and I always love pictures of them as they grow! I have made many new friends as a result! I prefer to place my puppies as loving family pets, at a reasonable price with limited AKC reg. I will sell with full AKC reg. to ethical breeders. Only RESPONSIBLE BREEDERS need inquire!! I DO NOT SELL TO PET STORES, PUPPY BROKERS, or PUPPY MILLS!!! I RESERVE THE RIGHT TO REFUSE PROSPECTIVE HOMES or SALES! I offer safe shipping thru Northwest Airlines. I accept NON-REFUNDABLE deposits of $100.00 - $200 on Dachshunds. A deposit is your guarantee that I will not place your chosen puppy with another party, and my guarantee that you will purhcase the chosen puppy. DOGS AND PUPPIES MAY BE VIEWED BEFORE PLACING DEPOSITS, BUT I WILL NOT HOLD A PUPPY ON YOUR WORD ALONE. PUPPIES MUST BE PAID FOR IN FULL, BEFORE THEY LEAVE HERE. Click on the picture of contract below to view a readable version!! 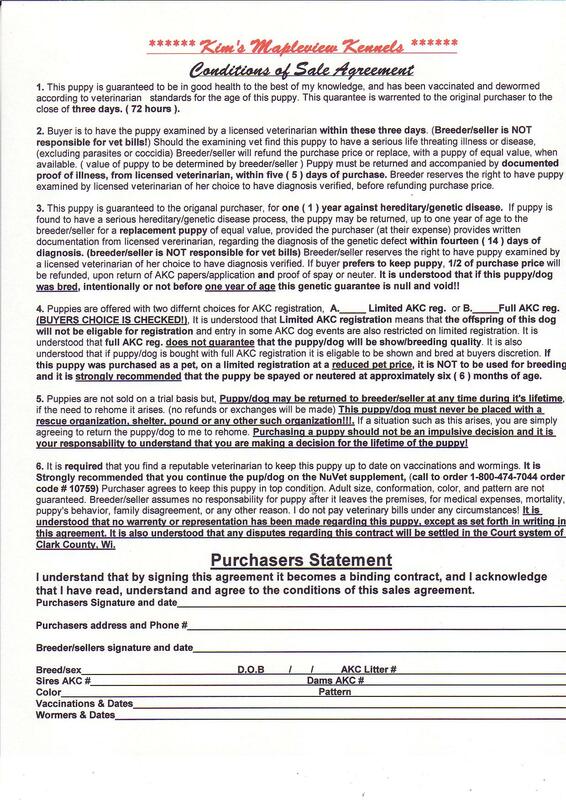 Please click on picture of contract to view!!!!!! Click on picture to view readable version!! PLEASE READ THE STORY BELOW! PLEASE REMEMBER, "A LIFETIME RETURN POLICY!" I feed Purina products, puppies are raised on "PURINA PRO PLAN", I also give my dogs and puppies a nutritional supplement/vitamin called "NuVet Plus", this is a supplement that provides powerful antioxidants, which give the immune system a tremendous boost. I strongly recommend you continue this supplement for the long term health and longevity of your new baby. These vitamins cannot be purchased in stores. To order your supply of NuVet plus, call 1-800-474-7044 order code # 10759 (you must give this order code # ) Click the link below for more info on NuVet Plus. Click here for health info. Although I prefer my puppies are placed in a home that the new owner owns, I understand that at times circumstances arise that make moving or renting necessary, CLICK ON THE SOLD SIGN BELOW for a company that insures pet owners rental deposits, this may make finding a new place to live easier. My family brought me home today, cradled in their arms. They cuddled me and smiled at me and said I was full of charm. I sure do love my family, especially the girls and boys. They played with me and laughed at me and showered me with toys. They even loved to feed me and gave me special treats. They let me sleep with them all snuggled in the sheets. They loved to take me for walks, often several times a day, they even fought to hold my leash I'm proud to say! These are the things I will never forget, a cherished memory. Now I live in a shelter without my treasured family. They used to laugh and praise me when I played with that old shoe, but I did not know the difference between old and new. We would grab a rope and for hours we would tug and tug, I thought I did the right thing when I chewed on the bathroom rug. They said I was out of control and would have to live outside. This I did not understand, although I tried and tried. Then the walks stopped one by one, they said they had no time. I wish I could change things, I wish I knew my crime. My life became so lonely, in the backyard on a chain, I barked and barked all day just to keep from going insane. So they brought me to this shelter, but were to embarressed to say why, They said I caused an allergy and went on their way. If only I had some classes when I was just a pup, I would not have been so hard to handle when I was all grown up. "You only have one day left" I heard the shelter worker say. Does this mean I get a second chance? Do I go home today???? Buying a puppy is an awesome responsability, for the sake of an innocent life....please make sure that you are ready, willing and able to stick with it for the rest of his or hers life!